We do not and will not ship unweaned babies of any kind so please don't ask, even if you are a very experienced hand feeder. The babies are incubator hatched and handfed from day one. Unless other wise specified. We find this makes for a very tame sweet baby more so than those that are with the parents for a few weeks. We do at times let the parents raise their own babies but these are not sold as handfed babies but as young potential breeders not tame handfed pets. Our babies are very socialized and tame, we start them playing in and out of shipping kennels far before they are ever shipped to make this a very stress free transaction. They are very accustom to the kennels so they travel well when shipped. That way they think the kennels are fun, kennels are yours to keep and make a nice carrier when you need to transport them if you need to take them somewhere there after. We us Delta to ship our babies at this time and have found them to do a very good job in only temperature controlled areas of the plane. Delta personnel hand carry our little feathered children from plane to plane and to again temperature controlled cargo or the direct terminal depending on the destination flight. We have never had life threatening problems in shipping at all but do pack food and treats on top of the kennels in case of a lengthy delay in flight. Water is not in the kennel as it can spill leaving baby with nothing to quench his/her thirst, for this reason we place juice oranges, apples and or grape fruit so baby will have a source of moisture for the entire trip in shipping. food and treats are also in a dish or dishes inside of the kennels. Instructions to the airline are on the out side of the kennel for food and water in case of a stay over (which has never happened with Delta) but we make sure we cover all possible scenarios, in case this ever happens. All babies have always arrived live, if you receive a baby you are not happy with upon arrival we will except it back but the return shipping costs will be yours and we expect them to be sent back in the condition you received them. It is wise to look in the kennel to check your baby or babies at the airport. We guaranty live arrival always! We make the shipping and handling transition as smooth as possible and find it less stressful than picked up and traveled with at a distance in a car. We expect your baby to be treated well as a small feathered child you are adding to your family. Because we are a small aviary we believe we give each baby a more personal touch than if we were a large aviary. 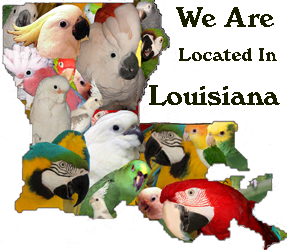 Being a small aviary we do not take credit cards at this time and only except U.S. postal money orders as they can be tracked if lost and or replaced much more easily than other forms of payment as these are considered to be a government document. You don't lose your money in transaction that way. When we receive payment we call you to confirm receipt of the US postal money order and or email you as well. Please include a telephone number you would like to be called at with your postal money order so we may confirm receipt of your postal money order as well as your email address so we came email you a receipt confirmation that you can print out for your record. Once your baby is paid in full we ship within days provided the weather allows and your baby is weaned. You will be given a tracking number so you may track your baby on line and or call Delta direct with this transition number. Sometimes during the year due to temperature we can not ship too some areas...if it is too hot or cold. But will ship as soon as weather provides for your destination. Weather must be good at all involved stops for the us to ship your baby and this is for the babies safety as well. We can ship year round to most airports within the United States. I get the babies placed on the shortest flight possible so that they have more time to get acquainted with their new surroundings at your home if at all possible. I do not like to ship on weekends but arrangements for that can be made if a week day is not possible for you. Note also that major holidays are not a good time to ship do to the heavy loads of luggage and people flying.